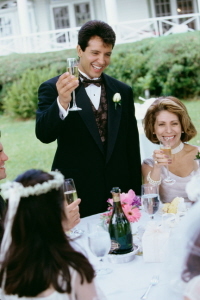 Many people think of the Best Man’s speech or the Groom’s speech when they think back on a specific wedding reception. The Maid of Honour’s speech gets lost in the shuffle of the wedding. There is no reason to expect, however, that a well thought out Maid of Honour speech can’t steal the show and be the most memorable speech of the day. As maid of honour, you have a lot to do that day. You have to get the bride dressed to be the “prettiest bride ever” and you have to make sure she makes it to the church on time. You have to dry her tears and make sure she gets something to eat that morning so she doesn’t have to feel faint in her tight gown at the ceremony. You have to take care of every little detail surrounding the bride’s activities on her special day plus you have to come up with an engaging speech. You should think of what you want to say in advance of the ceremony and reception. 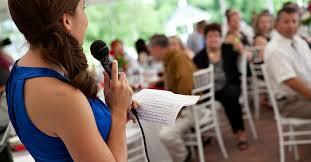 That way, nerves won’t get in the way of your giving a great speech. Practice the speech several times and don’t be afraid of putting a few words (or the whole speech) on a card you have with you at the table. Step 1. A Maid of Honour speech is similar to the Best Man’s speech. While the best man pokes fun at his friend, the groom, the maid of honour gets her chance to roast the bride. She can do this through the use of slightly embarrassing or funny stories about the bride before she got engaged and after she got engaged. The maid of honour should know a great deal about the bride so that she can come up with as many cute and funny stories as possible. Tell the stories just like the best man would say about the groom. Step 2. The maid of honour should thank the bride and groom in this part for letting her have this time to speak. This means something special because not many bride’s invite their maid of honour to speak at her reception. Step 3. This is the time to speak about your relationship with the bride and about what kind of friend she is. Give a description about who she is as a person and about her positive personal attributes. You can kid her about some of her more quirky things as well during this part of the speech. Be as sincere and truthful as you can during this section of your speech. Step 4. Be sure to take the time to share stories you know about that speak of the bride and the groom together. Be sure not to duplicate what anyone else has already said. Step 5. Try to offer some sincere advice about marriage or about relationships in general. Try to be romantic or funny about your advice before wishing the bride and groom the very best in their marriage. Category DIY Speeches | Tag maid of honour speech | Bookmark the permalink.